The meaning of the Hand symbol represented success in hand to hand combat. Native Indian symbols were used for a variety of reasons and depicted on numerous objects such as tepees and clothes. 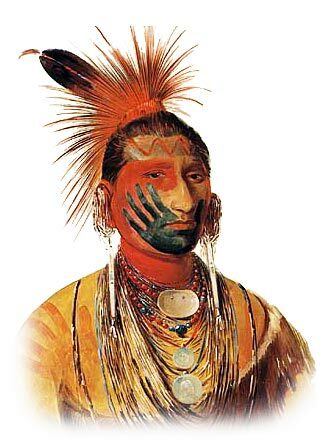 In the instance of the Handprint this was a common symbol that was painted on the face of an Indian, as in war paint and also painted on their war horses - refer to Hand Symbol, War Paint and Horse War Paint. Native American Indians had a highly complex culture, especially those who lived on the Great Plains. Their religion was dominated by rituals and belief in a spiritual connection with nature and these beliefs were reflected in the various symbols they used such as the Handprint symbol. The clothes, tepees and all of his belongings was decorated with the symbols depicting his achievements, acts of heroism, his various spirit guides or the most important events in his life. Every symbol used by an American Native Indian had meaning which can be accessed from Symbols and Meanings.